A single satellite can’t monitor the whole Earth at once. So when NASA-JAXA’s Global Precipitation Measurement (GPM) mission proposed to gather worldwide rain and snow data every three hours, they turned to the international community for help. The GPM mission is led by NASA and the Japan Aerospace Exploration Agency (JAXA). The two space agencies joined forces to build and launch the GPM Core Observatory that uses a radiometer, built by Ball Aerospace & Technologies, Corp. of Boulder, and radar built by JAXA to take two- and three-dimensional observations of precipitation. The GPM Core Observatory satellite anchors a network of Earth-observing satellites operated by other countries and other U.S. agencies. Called the GPM constellation, at least 12 partner satellites will contribute rain data to GPM’s global data set. None of the partner satellites were built and launched specifically for the GPM mission. Instead they are satellites of opportunity; their respective agencies launched or will launch them as part of their own scientific and weather-monitoring programs. As part of the GPM mission, however, they have agreed to provide satellite measurements that will be converted to precipitation-related data. The satellites’ different orbits and coverage zones turn the constellation into a network with broad coverage of Earth at any given time of day. The GPM Core Observatory has an orbit that will overlap with the orbits of the other satellites, which allows the final calibration step to ensure globally consistent precipitation data. Because of this, the GPM Core Observatory will be able to serve as a common reference for all the satellites, allowing scientists to meaningfully compare data across the constellation and create a single next-generation precipitation data set. GPM is also able to make available global precipitation data every thirty minutes by combining the constellation data with geostationary satellite infrared data. 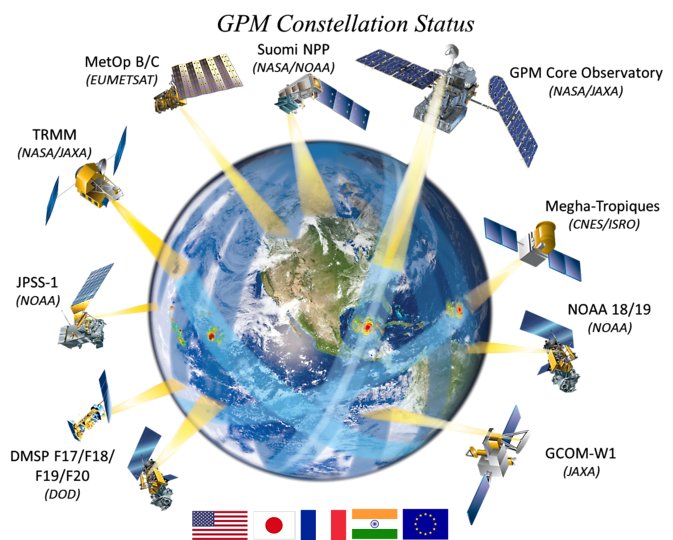 The GPM Constellation members include: the Suomi National Polar-orbiting Partnership (Suomi NPP); MetOp A and MetOp B satellites, NOAA 18 and NOAA 19; the Joint Polar Satellite System-1 (JPSS-1); Defense Meteorological Satellite Program (DMSP) F17, F18, F19, and F20; Global Change Observation Mission – Water 1 (GCOM-1W); and Megha-Tropiques.